Between the region of the small inner planets and the sparsely inhabited region of the comets there are 4 giant planets: Jupiter (with a mass equivalent to 318 Earths, a diameter of 142984 km and orbiting the Sun at 778 million km from it), Saturn (95, 120536, 1427 million), Uranus (15, 51118, 2871 million) and Neptune (17, 49528, 4497). Among the giant planets, Jupiter is the one that displays the most similar composition in regard to the primitive solar nebula, consisting in 74% of hydrogen, 24% of helium and 2% of heavier elements. Hydrogen and helium also mainly compose Saturn, but the latter is scarce at the upper layers. On the other hand, Uranus and Neptune appear to be essentially composed by ice (water, ammonia and methane) and rock. 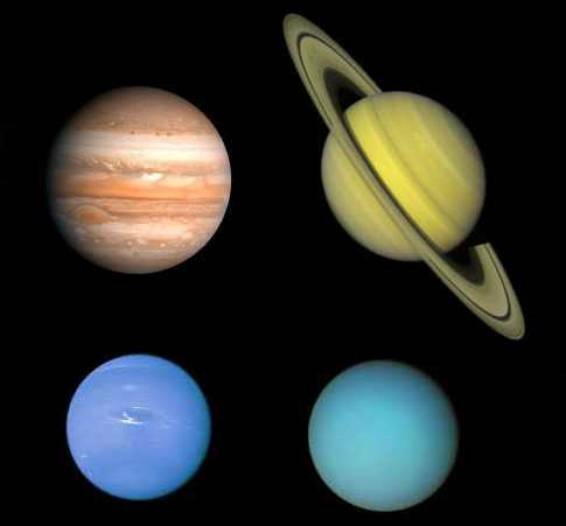 In the case of Uranus and Neptune, it's noticeable that the ratio diameter/mass is not very different from the one that would be expected in planets entirely composed by water. On the other hand, Jupiter and Saturn display ratios that would be expected in planets with compositions similar to the Sun's. Although Jupiter has more than 3 times the mass of Saturn, its diameter is just slightly bigger, which is due to the higher compression that subjects its interior. Under the pressure of 1 bar (close to the atmospheric pressure at the Earth's surface), the temperature is 165 ºK in Jupiter, 135 ºK in Saturn and 76 ºK in Uranus. At this level, the hydrogen appears under the form of a molecular gas (H2). At deeper levels, where the pressures are higher, the temperature and density of the gas gradually increase. Under the pressure of 100 000 bars, the gas starts to look like a hot liquid. The transition is gradual, given that the temperatures are well above the critical point of the hydrogen, which is equal to 13 bars and 33 ºK. 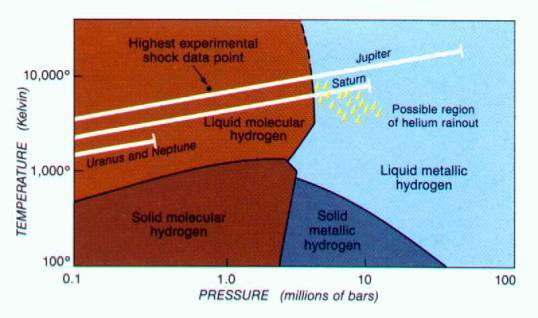 20 000 km below the top of the Jupiter's clouds, the liquid hydrogen is submitted to a pressure of more than 4 million bars and to a temperature of 10 000 ºK. The molecular connections disappear, giving place to another form: the liquid "metallic" hydrogen. Just as in the interior of the Sun, this form of hydrogen consists in a plasma of stripped protons and electrons, though at a temperature that is considerably inferior to the solar. The hydrogen then behaves like a molten metal, being an electric conductor and opaque to the visible radiation. Saturn is less massive and, for that reason, the internal pressures are lower. Even so, it's thought that Saturn also contains liquid metallic hydrogen in its interior. On the other hand, in Uranus and Neptune the hydrogen seems to be confined to the upper layers. So, it is unlikely that they contain any metallic hydrogen, although the opposite shall happen in regard to the liquid molecular hydrogen. The Saturn's atmosphere seems to be stripped from helium, comparatively to its estimated proportion in the primitive solar nebula. This fact may be due to the insolubility of the helium in the metallic hydrogen, when the temperatures are low enough. It's thought that these conditions occur in Saturn. If this separation actually occurred in Saturn's interior, then the helium should have migrated (rained out) to the metallic hydrogen region. This region would then have been enriched with this element. It is thought that Jupiter and Saturn possess rocky and icy cores, with masses ranging between 10 and 15 times the Earth's mass. The exterior surfaces of these cores must be subjected to a temperature of 20 000 ºK in Jupiter and 12 000 ºK in Saturn. 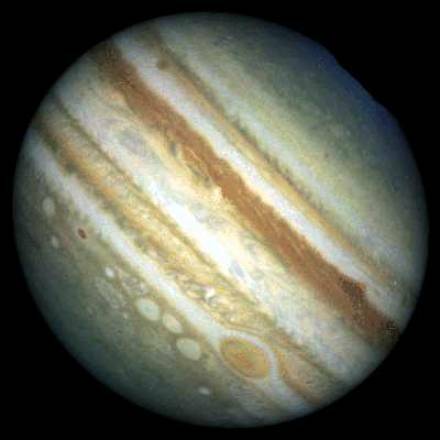 At those surfaces, the pressure must be 42 megabars (million bars) in Jupiter and 12 megabars in Saturn. It's thought that Uranus (14,5 terrestrial masses) and Neptune (17,2 terrestrial masses) are basically cores of rock and ice, which are present there in "solar" proportions (similar to the ones existing in the primitive nebula). In other words, they shall be composed by little more than ¼ of rock and almost ¾ of ice (water – H2O, methane - CH4 and ammonia - NH3). Under the conditions that prevail there, this ice shall, however, behave like a liquid and hot soup, rich in chemical species derived from those molecules. Contrarily to what happens in the inner planets, the internal heat generated inside the giant planets is due, along with the radioactive decay, to the kinetic energy caused by the gravitational contraction. 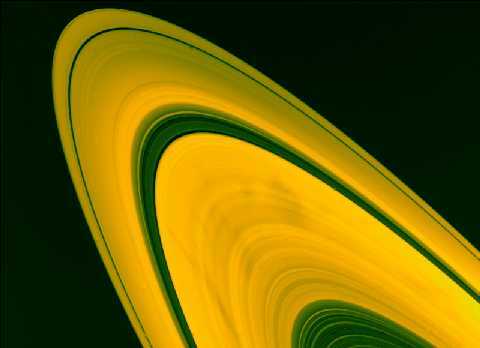 However, Saturn seems to generate more heat than what would be expected in regard to its mass. That may be due to the sinking of dense components, like helium, towards the planetary centre. In the deep interiors of Jupiter and Saturn, the convection creates and sustains powerful dynamos in the zones of metallic hydrogen, which in turn generate strong magnetic fields. In Uranus and Neptune, the slow convection of their internal fluids shall be the responsible factor for the observed magnetic fields. Another source of internal heat in the giant planets is the tides provoked by their satellites. This fact triggers the creation of currents in the internal fluids, which very gradually slow down the rotation of the planet. A portion of the energy thus generated also helps moving the satellite into farther orbits. "Temperate" species (like the CO and the N2) that are only stable in the deep regions of very high temperatures and pressures can, nevertheless, be observed in the zone of the atmosphere where the temperature assumes comparatively modest values of 1000 ºK or less. What gives birth to this phenomenon is the fact that, in that region, the duration of the chemical reactions until the balance is reached can become longer than the time taken by these species to attain those altitudes (mixing convective time). Not only the convection, but also the condensation in clouds, the photo-dissociation (under the action of the light), the bombardment by charged particles (auroras) and the electric discharge (lightning) are responsible factors for the formation of unstable molecules in the several atmospheric layers where they occur. It's thought that close to the lower limit of the described zone, the condensations (clouds) are mainly composed by iron, magnesium and silicon trioxide (SiO3). In the troposphere, the dominant gases, apart from the molecular hydrogen and the helium, are the water (H2O), the ammonia (NH3) and the o methane (CH4). 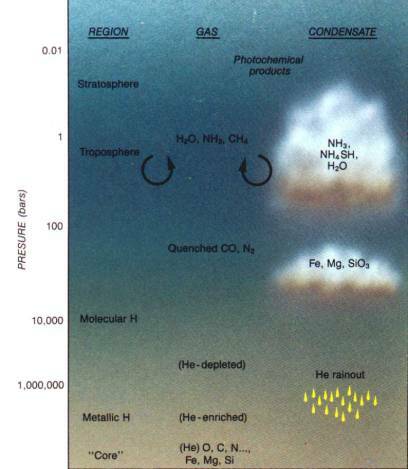 In this layer and descending in the atmosphere, the clouds are essentially composed by ammonia (which condenses at cooler temperatures, in the higher layers of the atmosphere), ammonium hydrosulphide (NH4SH) and water (which condenses at warmer temperatures, in the lower layers of the atmosphere). In Uranus and Neptune, the temperature of the high atmosphere is so low that it also allows the condensation of methane, which is the responsible molecule for the blue colour of these two planets. Finally, it's noticeable that the compression degree of the giant planets' atmospheres is proportional to the gravitational acceleration exerted on each one of them. Therefore, the Jupiter's atmosphere is the most compressed and the thinnest, or in other words, the distance between two given layers is lower, just like the distance between a region where the atmospheric pressure assumes a determined value and another region where that variable reaches twice that value. In the giant planets, the way the temperature changes according to the latitude is an indicator of how effectively the winds distribute the heat from the zone that the Sun targets more strongly (sub-solar zone). In Jupiter, Saturn and Neptune the Sun targets more strongly the equator and in Uranus, given the tilt of its rotation axis, the Sun heats more strongly the poles. In these 4 cases the temperature differences between the latitudes are modest, smaller than they would be without the winds. This doesn't mean that the heat is transported by the winds themselves (that doesn't actually seem to happen, given the structure of the winds in stream lines that are confined between two fixed latitudes), but this redistribution may rather take place in the fluid and hot interiors of the planets, although it's not yet clearly known how does that happen. Besides the heat, the atmospheric flow transports mass and chemical species, thus changing the atmospheric structure. The structure, in turn, controls the light absorption, its re-emission as infrareds and the release of heat during the condensation. These factors determine the temperature and, therefore, the winds' pattern. On the other hand, the internal heat is transported through convection until it reaches a zone of the atmosphere that is transparent to the infrared radiation, which can irradiate the heat directly into space and, this way, get cooler. It's thought that the convective flows provoked by the generation of internal heat hold a very important role in the dynamics of the giant planets' winds. Above the zone where the pressure is 100 mb (1/10 of the pressure at the sea level on Earth), the temperature rises with the altitude, because up there the atmosphere absorbs the solar radiation. A photochemically produced haze (under the action of the solar rays) can be the cause for the absorption of the additional light that concurs to the heating of the surrounding zones. Higher up, in the thermosphere, even small quantities of energy may heat the atmosphere up to very high temperatures. In Jupiter, along with the solar light, also the downpour of charged particles (ions) proceeding from the satellite Io contribute to the heating of this region (up to 1000 ºK). Almost all the planetary rings are found inside the Roche limit, or in other words, they are placed at so short distances from the planets that the tidal forces exerted by them prevent the formation of big fluid objects. For the solid objects, the equivalent to this limit is placed at an even shorter distance from the planet. What may have provoked the formation of the rings may have been the destruction of the objects when they overtook the Roche limit or the prevention of the accumulation in bigger objects of the material existent inside that limit. 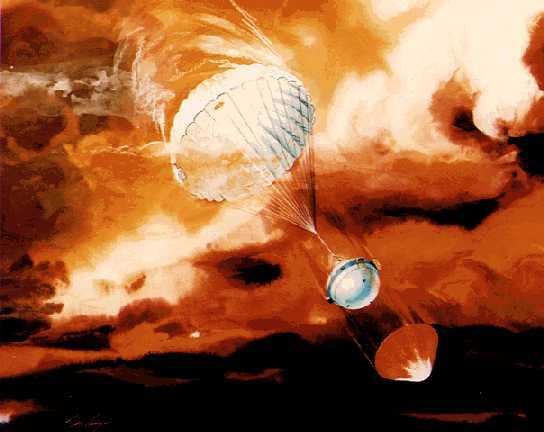 Besides that, the primordial material that existed at a short distance from the planet could have been lost on its surface through the Poynting-Robertson drag (due to impacts with the solar photons) or through the atmospheric drag. The satellites perform an important role in the structure of the rings, since they gravitationally disturb the ring's particles, confining them to determined orbits.